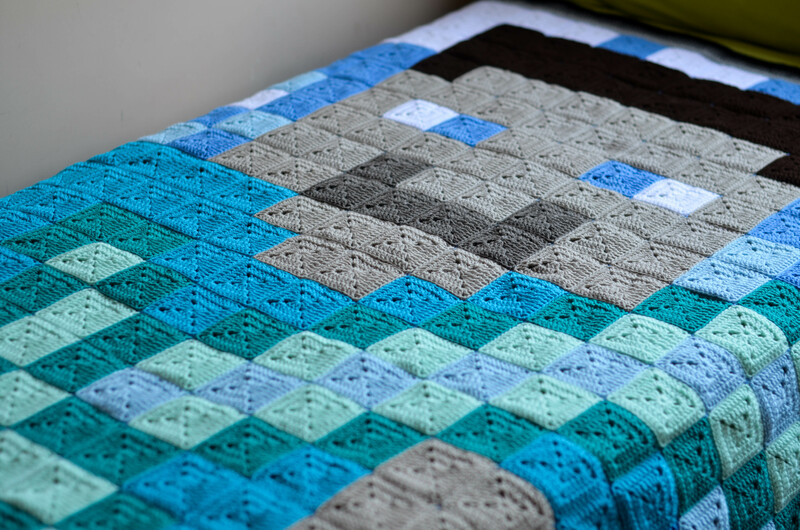 As promised here is the pattern for the Minecraft Blanket that I made my Mr A. It’s an easy to pattern to follow as it’s just made up of placing the granny squares in the appropriate positions to get the picture you want to portray. 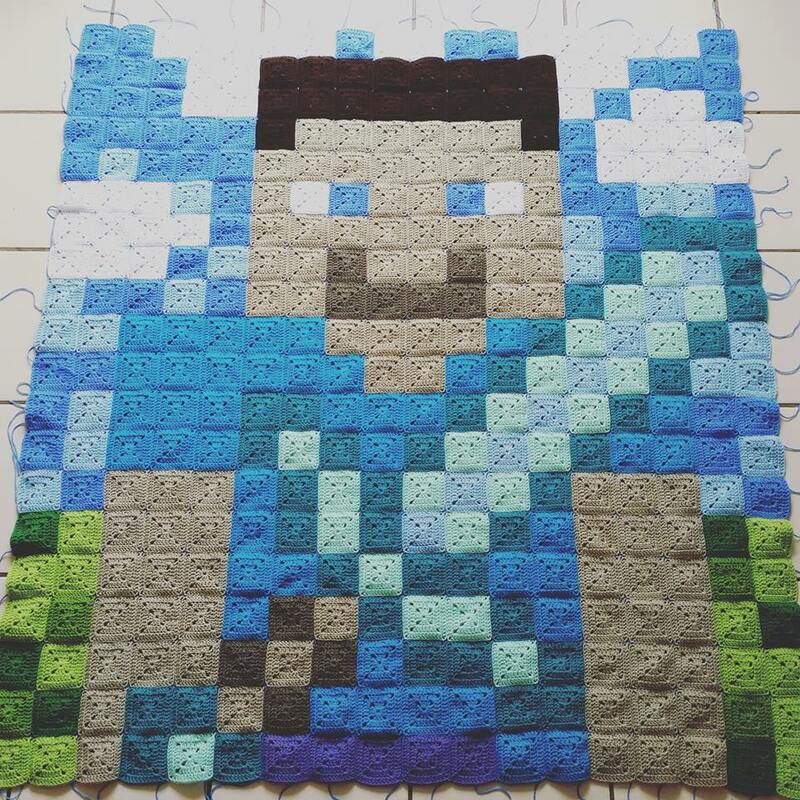 And lucky for me, Minecraft is a pixel game made up of lots of squares, so a good starting point for my first ever granny square blanket. The finished fits perfectly on a single bed and measures approximately 172cm x 184cm. Each square measures approximately 8.5cm. Good idea to weave in ends after you finish each square. 8 ply or dk yarn is used (see below for how much). Stitch conversion chart from Yarn Forward. 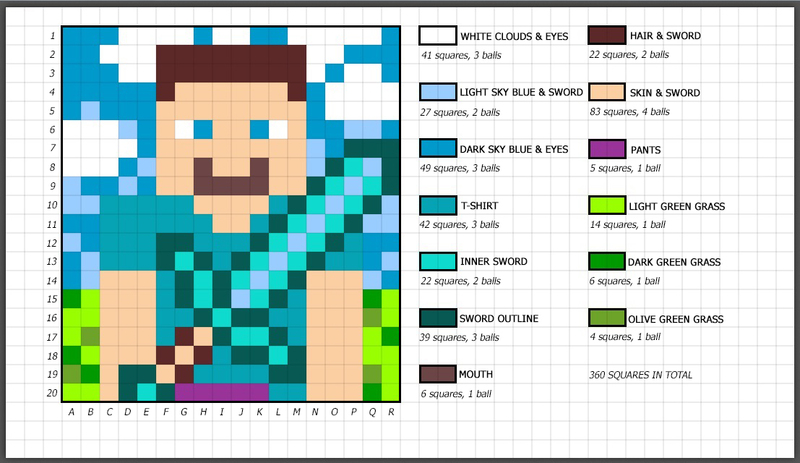 Here is the original drawing of Steve and the Diamond Sword. 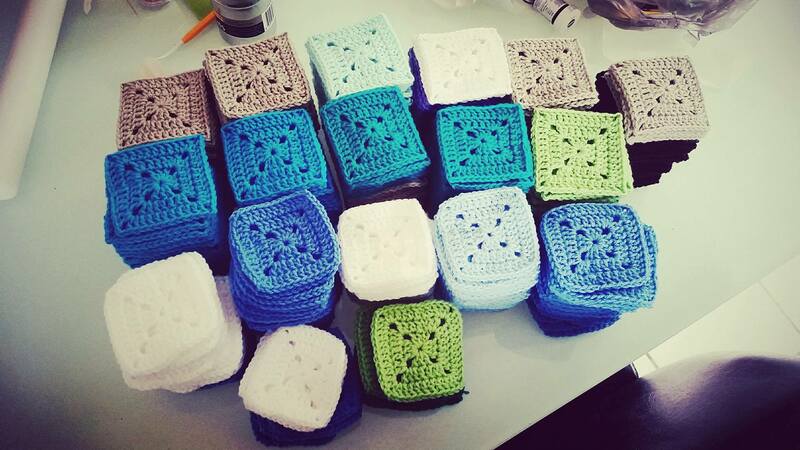 This is how I worked out how many squares in each colour to crochet. 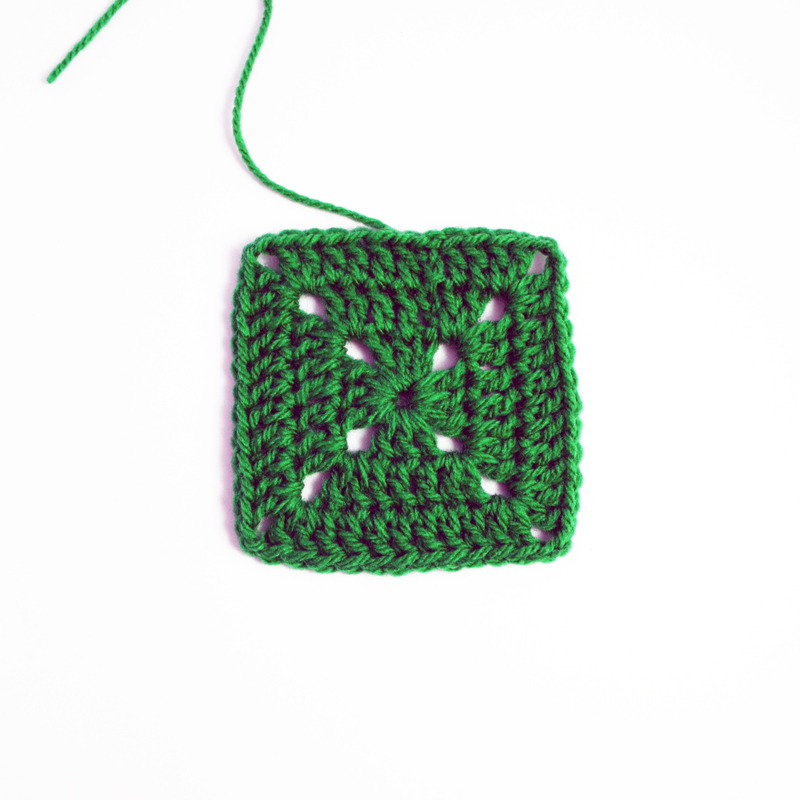 Make a simple solid granny square. Step 1. Ch4 (or you can use a magic ring), join with ss to 1st st made, ch2 (counts as dc (tr) here and throughout the pattern), 2dc (tr), *ch2, 3dc (tr)* repeat from * till you have 12 sts, join with ss to ch2 (first dc (tr)). Step 2: Ch2, dc (tr) in the next 2 sts, 2dc (tr) in the ch sp, ch2, *2dc (tr) in the ch sp, dc (tr) in the next 3 sts, 2dc (tr) in the ch sp, ch2*, repeat from * to * until you get to the last ch sp, 2dc (tr) in the same ch sp, join with ss to ch2. You should have a total of 7 sts on each side. Step 3: Ch 2, *dc (tr) each st across, 2dc (tr) in ch sp, ch2, 2dc (tr) in ch sp*, dc (tr) in each st across (7 sts), repeat from * to * until you get finish crocheting in the last ch sp. dc (tr) in the next 2 sts, join with ss to ch2. You should have a total of 11 sts on each side. Cut yarn and weave in ends. Yay now you have to make 359 more in the appropriate colours. (see chart above). 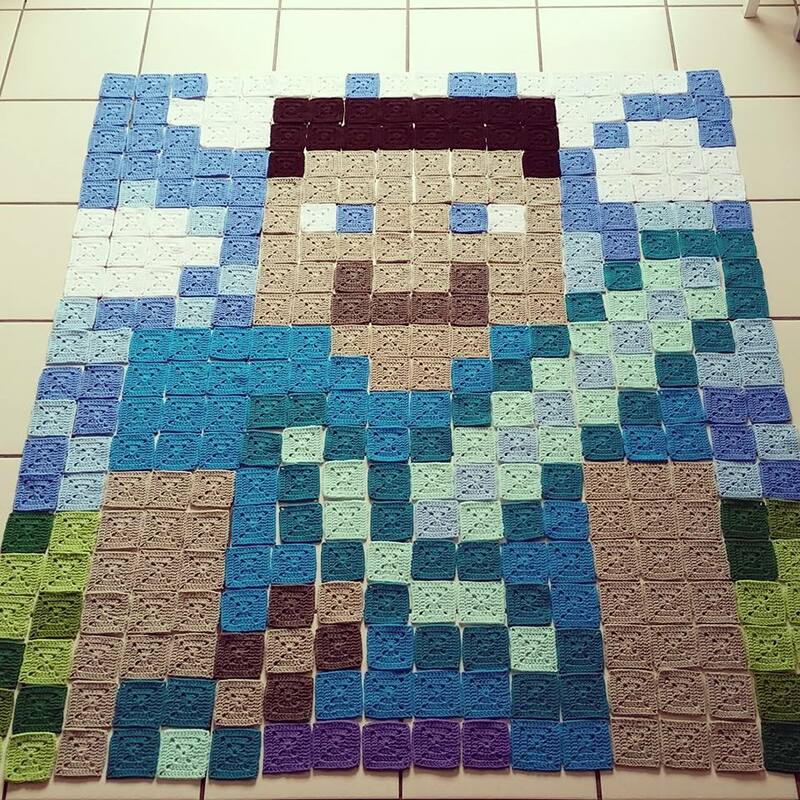 Throughout making the squares, I found it a good idea to lay them all out to see what the design looked like. It also gave me a sense of accomplishment as you could see it all coming together nicely. Constantly count your squares and tick them off the colours/parts as you do them, it makes it easier when working out what you’ve done and got to do. Pictured above you can see the difference blocking makes. I like the look of a blocked square. Get your yoga mat/ironing board/or whatever it is you’ve chosen to pin your squares to, pins, iron and squares. 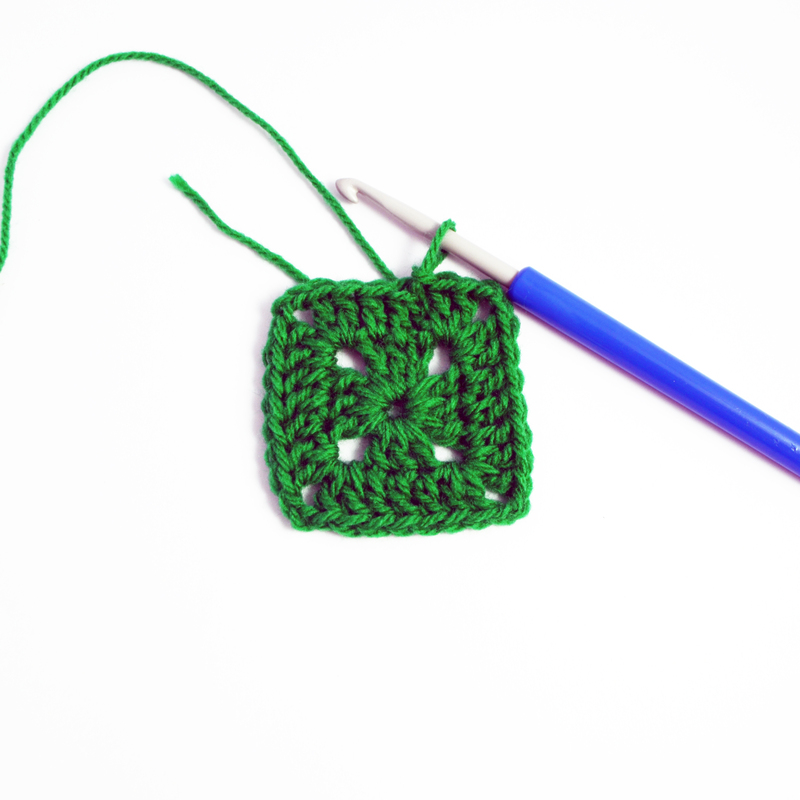 Place a square on the mat and pin out each corner firmly so that it makes a nice square shape (they look more rounded when you just crochet them). Turn your iron on to steam and hover over the square for a few seconds, remember to not let the iron touch the actual square. Stay about 1-2cm away from it. Let it slightly cool and take it off, leaving the pins there so you have the same size square for the rest of them. Continue until finished. I’m not entirely sure that the squares need blocking before joining, but it was my first blanket so I blocked, still happy that I did though. Go with your preferred method for joining squares if you already have one. Otherwise I used Attic24’s Joining Granny Square method. I found that really easy to do. First I laid out the entire blanket then collected the squares in order of their row. I worked horizontally first, but I doesn’t really matter as you do either horizontally or vertically first before starting the opposite way. I started from the top right of the design and working left adding each row underneath and joining that way until I finished joining them horizontally. Vertically joining them was easy as the blanket was already in a ‘finished’ position and all you had to do was join from one side to the other. Once you have finished joining you can move onto to the border. I just did a row of sc (dc) in light grey, then a row each of dc (tr) in light grey, dark grey and black. I did put ch2 in the corners of the blanket to keep it flat. And then ta-daa you’re finished! Woo hoo. 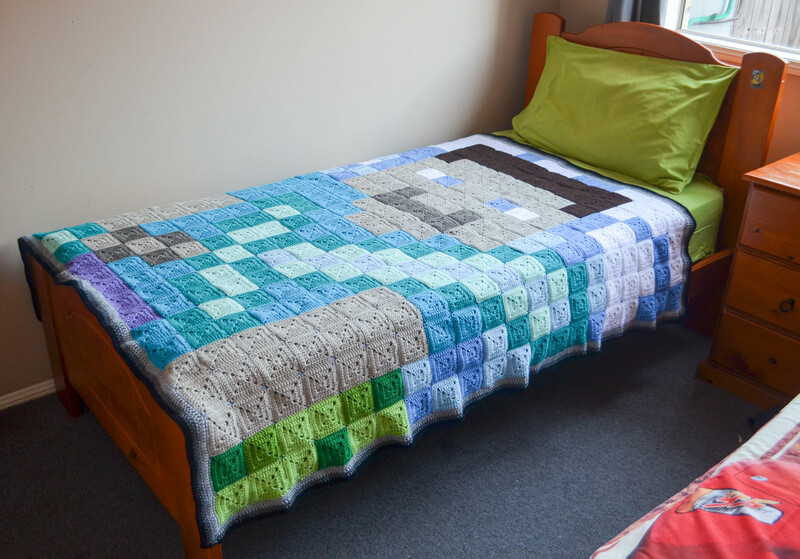 Here’s some more photos of the finished blanket. It fits perfectly onto Mr A’s single bed. It rarely leaves his side and I love that it means so much to him. Makes crocheting it all the more worthwhile and special. Wow! Beautiful! Which program did you use for the pattern/color chart? Thank you! Btw, I really love all your work! Very, very beautiful!! Thank you so much Wendy. You’re more than welcome. 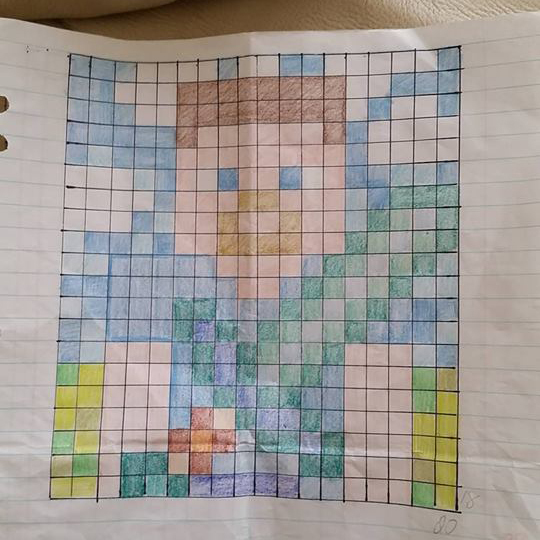 My daughter is a nut about Minecraft. Thank you for posting this. It will be her birthday present and my first time blocking. Hi Carol, thank you for asking! I forgot about that. The balls are 200 gram each 🙂 Looking forward to seeing what you make. Thank you! 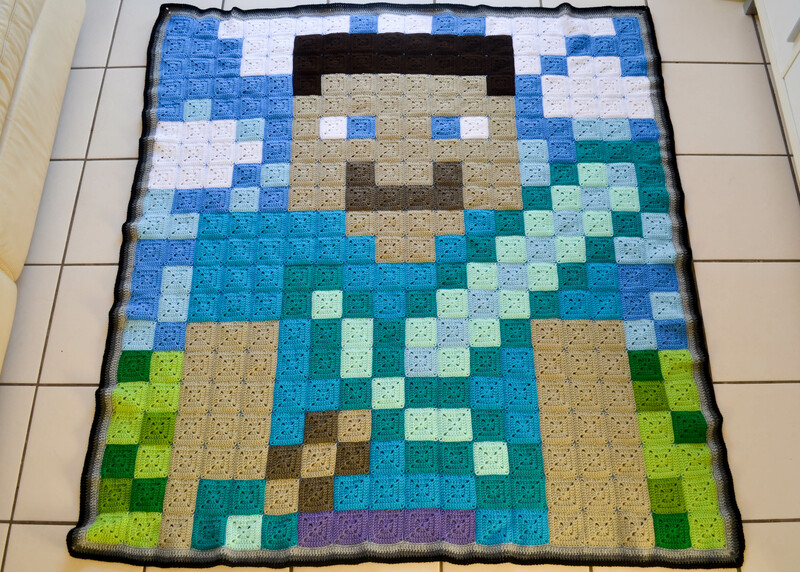 My son asked for a blanket the other day and I just came across your post! It’s perfect. Hey there! I’m so glad you came across it. Even better that it’s perfect! I hope you get to share the finished piece. Happy Hooking it. 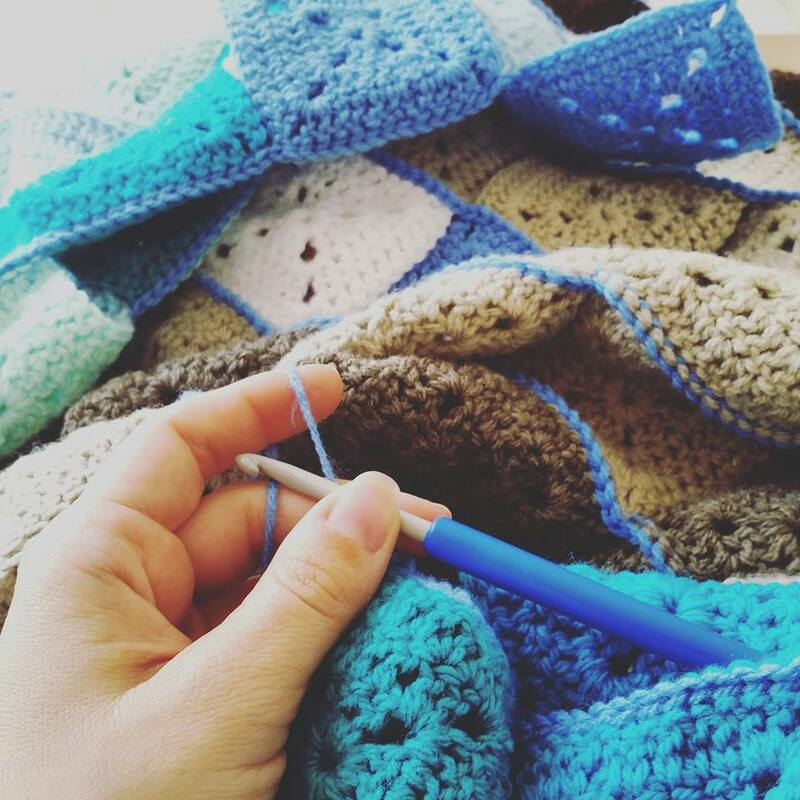 What are the colors you used for this blanket? Hi Emily. This is next on my hook for my 7 year old son. What yarn did you use for this? I have pre-ordered your book from Amazon and can’t wait! I love your patterns – such beautiful work. Hi Jodie, I used yarn from Spotlight (Marvel 4 Seasons 8 ply) and Big W (Carnival) in Australia. I’ve just go finished your pattern but added a row of sc on each square to make it bigger. I’d love to send you a picture of the blanket but not sure how. 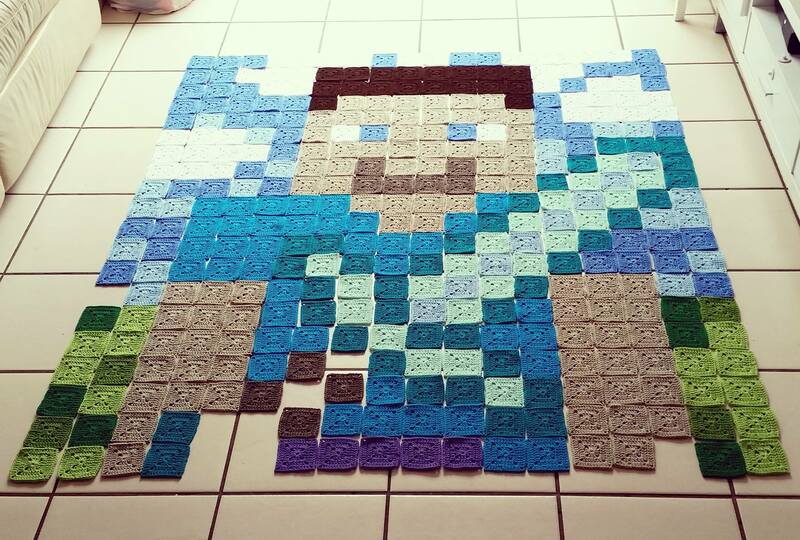 I honestly can’t thank you enough for sharing this wonderful pattern – my mini minecraft fan was blown away when he saw it! ooh yes please!! You can email it to me theloopystitches@gmail.com that would be wonderful to see thank you. What color yarn did you use to stitch it all together? Thank you!! 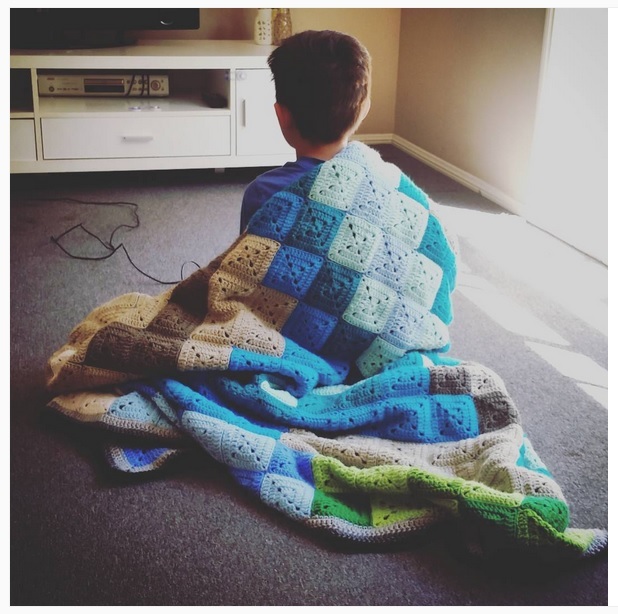 Making this for my grandson, love this thanks for sharing pattern!! Hi there, thank you so much for sharing your pattern. I just finished it for my grandson, i know he will love it, but I didn’t do a border around it, do I need to do one? I really like it without one, but if it needs one then I will do it. How do I make the the blanket smaller. Like half the size? How do I make it half the size? so cute!! My son wants me to make him one. What size is each little sqare? 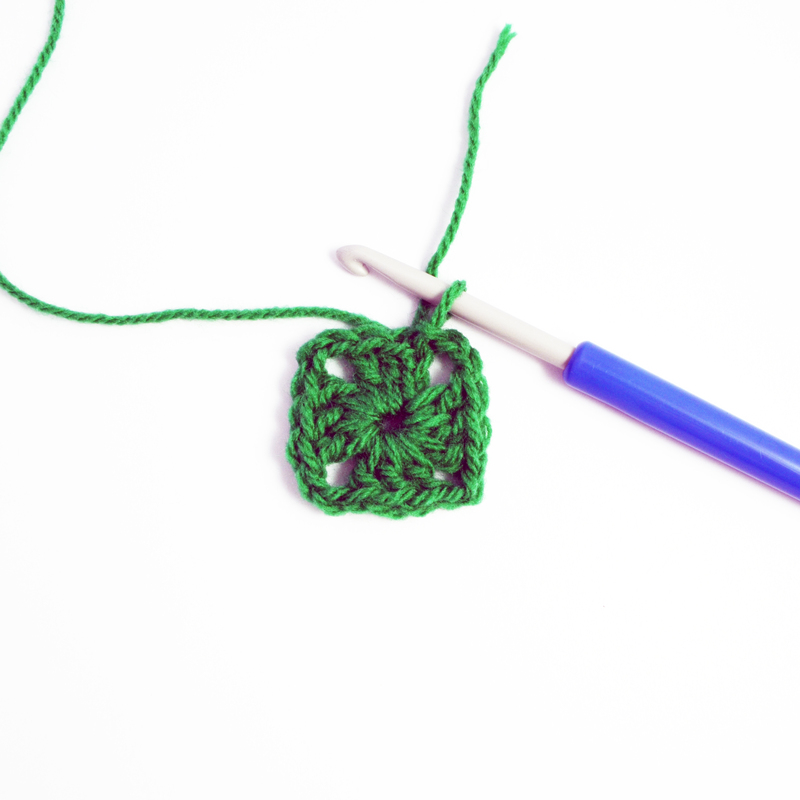 I do my crochet so I want to see this. I do not crochet so I want to sew this out of fabric. I made this for my son and he loves it. Thank you so much for posting it. It took me a lot longer than I thought it would but I was so proud once it was done! Wish I could post a pic of it here! !